C Is For Cookie. That’s Good Enough For Me! I haven’t had a cookie in a really long time and I think I must be nearing my breaking point because at this moment in time I can only think about one thing – and that one thing is ALL THE COOKIES! I blame all the posts about Holiday Baking that keep popping up in my timelines. I know an awful lot of Cookie Monster enablers, I fear. I am at once thrilled and disappointed that most of them are far away. So what is a Cookie Monster who’s gone right off cookies, to do? How can I get my thoughts out of my head while keeping my cookie cravings at bay? I can share some of the delicious theoretical cookies with you! Then you will be thinking about ALL THE COOKIES and I won’t have to bear this burden all by my cookie-denying lonesome. 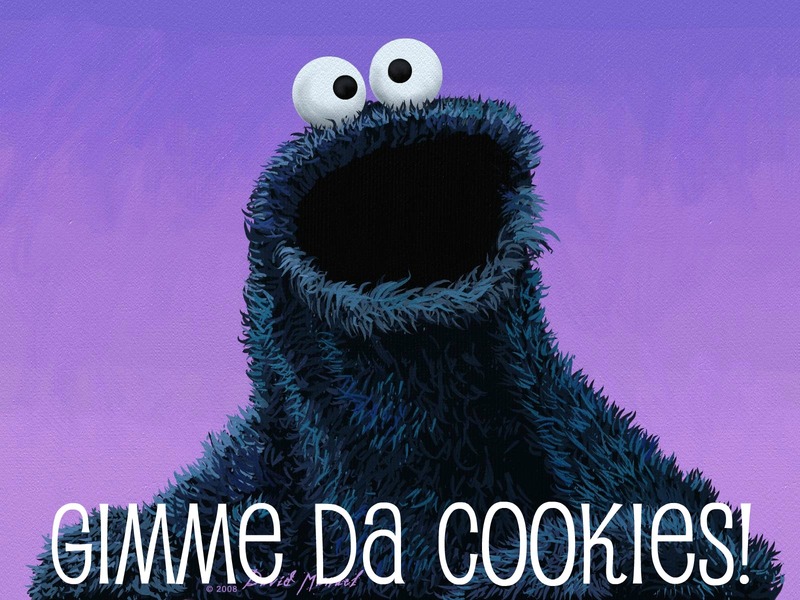 So, without further ado, I give you my current cookie obsessions. First there was this little Toblerone enhanced gem from Rebecca at A Little Bit of Momsense. Then, this beauty popped up in my Facebook timeline, shared by Candace from Life in Pleasantville. It is sure to be a hit with the kids. 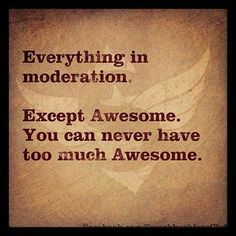 Especially if you go for the giant cookie technique that Kelly shares! Finally, (Well, for now at least, but I’m not making any promises!) Momstown Halifax shared this very easy, yet very pretty cookie that would be so fun to make with your Things! It came from the lovely people at CBC Parents. And here’s a little something to do during this upcoming Holiday season. You know, in your spare time. Whew! I feel much better now. Sorry**, for dropping all of that on you at once, but I feel so much better now. Wouldn’t you agree these are worthy cookies to share? If you’re a smart cookie, you will! Either way, now you can have all my cookie thoughts and hopefully I will have fewer. It’s a devious kind of kindness, but it’s ultimately out of love that I share these things. If you don’t like it, well … I guess it’s true what they say. We have had a lot of event filled weekends this Fall and, as a result, have fallen out of our Friday Family Fun Night rituals. Last weekend we were away from home (again!) and when we arrived home on Monday after an exhausting drive on a very foggy, driving snowy, blowing snowy, swirling snowy, rainy snowy, SNOWY snowy, Cobequid Pass, we decided that we would reinstate the Friday Family Fun Night tradition and have a weekend of very nearly zero obligations. We are trying to keep it simple, remember? In keeping with the manifesto, I made a very simple plan. 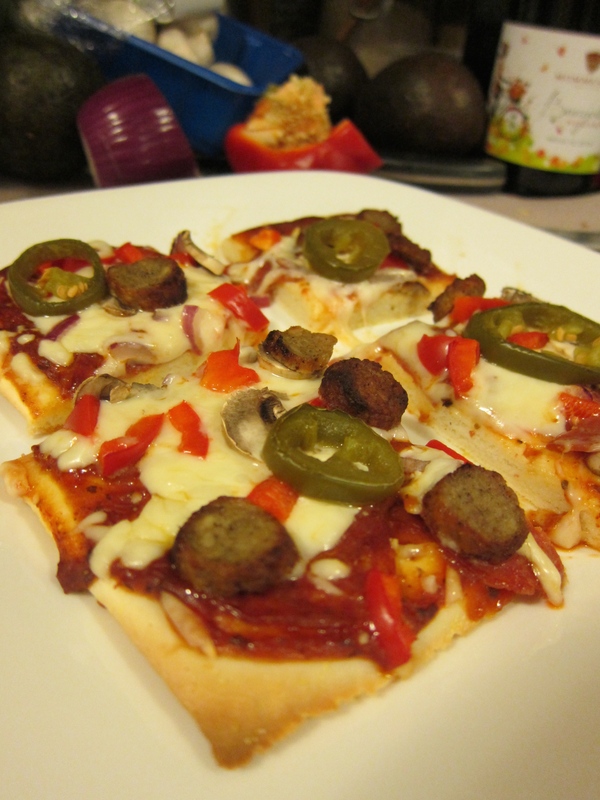 MYO Pizza – which everyone loves! To make it even simpler, I made all the pizzas using ready made pizza crusts. The Things shared this happy-making Pepperoni & Cheese pizza. 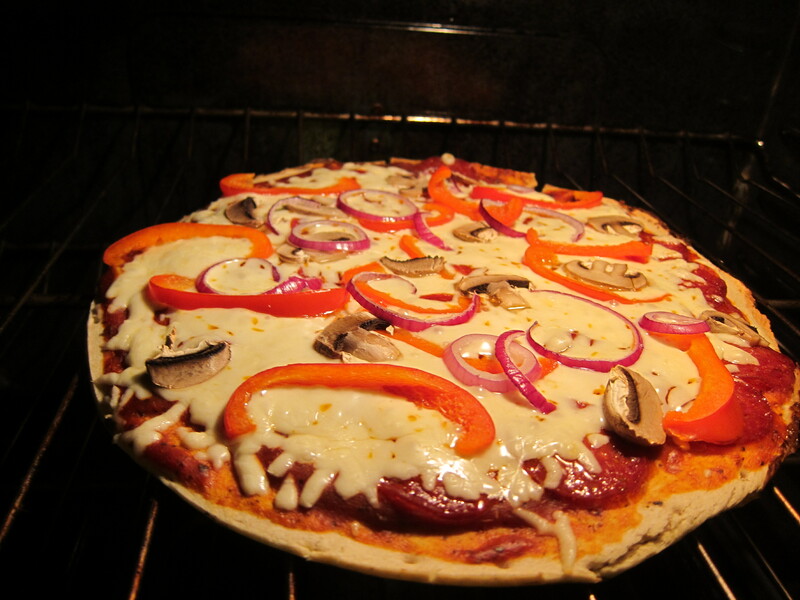 Daddy-O chose a more classic Pepperoni & Cheese with veggies (red pepper, red onion, mushroom). I was very excited to try the Kinnikinnick ready made gluten free crusts that friends in the know suggested. 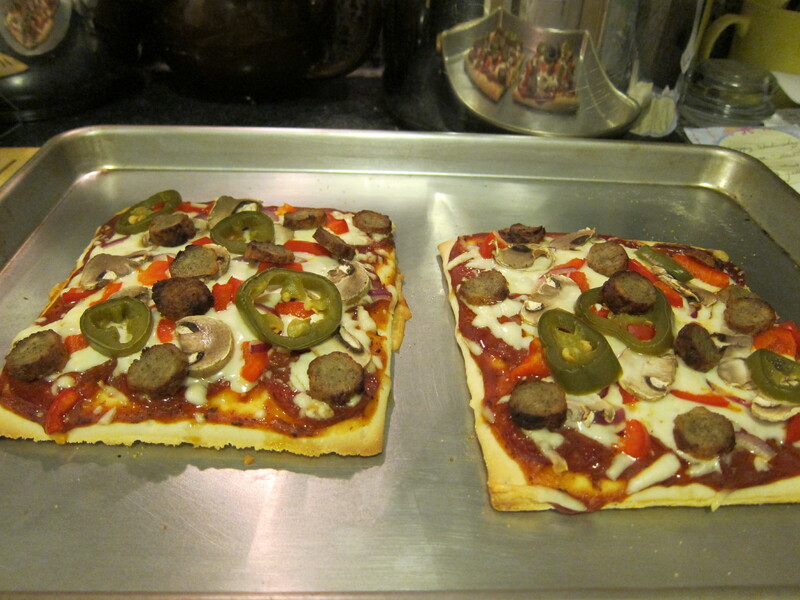 I am thrilled to report that the pizzas turned out great and that the crusts themselves are quite delicious. It’s really nice to know that I have a viable option for those nights when I just need to keep it simple. Mine had the Kinnikinnick crust, pepperoni, mozzarella cheese, red pepper, red onion, mushroom, pickled jalapeño slices, and gluten free turkey sausage. After everyone had full tummies it was time for us to settle in with the evening’s planned entertainment. We opted to skip a movie in lieu of the excellent Bullying Awareness schedule on the Family Channel. The cast of “The Next Step” hosted the evening and introduced some of our favourite shows – “Austin & Ally”, “Girl Meets World”, and “The Next Step” – all of which were featuring bullying storylines tonight as a part of their Stand UP to Bullying campaign. All three shows led to much discussion about friendship and bullying and how important it is to stand up and speak up and to never, ever be a bystander. We especially loved “Girl Meets World“. It is so well written and I love how they keep managing to tie “Boy Meets World” storylines and characters into the show. It’s just so well done! The Popcorn Pix feature presentation was another trip into bullying territory, with “Contest”. It was very good, but pretty harsh in many ways, as well. Very serious subject matter, obviously, and they hinted at some very heavy elements of being the bullied one. Overall it was very good. Definitely not for the younger ones. Thing 2 is 8 and she was snuggled up pretty close the whole time. Still though it’s such an important topic and we really cannot talk about it enough. No one can. Keep talking! What will be on your agenda this weekend? Did you take in any Bullying Awareness Week programs or events? Do you have an open dialogue with your kiddos and the young people in your life about bullying and mental health and how to get help if the need arises? Oh, you knew it was bound to happen. Here is my go-to recipe for fudge. Beat for 2 minutes with elecric mixer. All the usual rules apply. Score the fudge before it cools completely to make cutting the little squares easier. Now go forth and fudge-ify! *We have made this into a Mint Chocolate as well, by swapping mint extract for the vanilla. Oh, I’m not upset. No, no. Not at all. I just cannot stop thinking about fudge. You see I was supposed to be going to a Christmas Craft Show on the weekend, but due to circumstances beyond my control it didn’t happen. That means, that besides all the cool unique crafts and handmade stuff that I missed out on, I also didn’t get to buy fudge from some of the amazing fudge making folks that tend to frequent the Christmas Craft Show circuit. I will also be missing another local Christmas Craft Show next weekend. It’s not like I need fudge. I mean, really. Does anyone need fudge? No. Of course not. Christmas Craft Show fudge is so good! I could just make some fudge, I suppose. I can never make it the way the super fudge makers make it, though. I have a decent recipe. A few, even. There are plenty of recipes online. There is no shortage of recipes, really. There is merely a shortage of fudge. I should just forget about it. Help me to feel less kooky. Is there a treat-y food that you have very rarely, but that when you do have it it has to be made a certain way? Or come from a certain place? 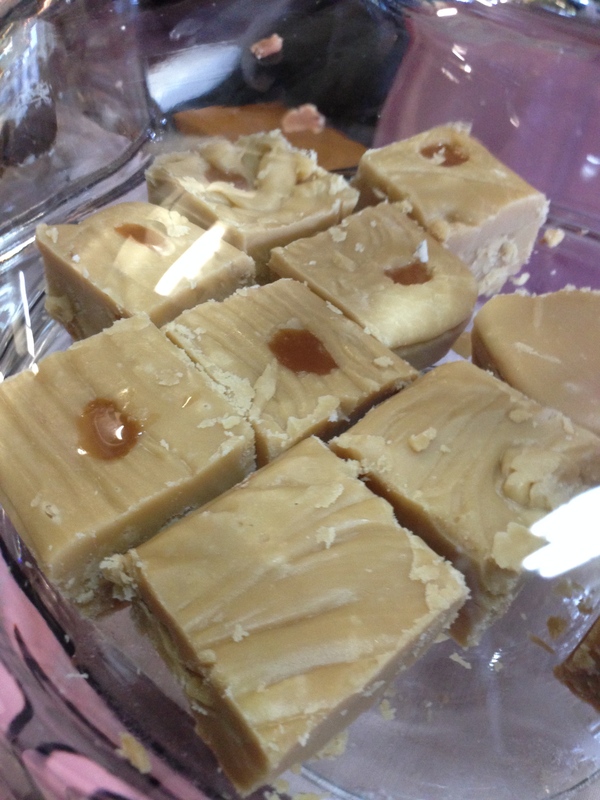 Feel free to share a recipe or your thoughts on fudge in the comments. I will share my best fudge recipe here with you all another day, but have you seen this*? *A very funny tweep – @evilpez4 – shared that and will be blamed in absentia for any and all fudge related weight gain this upcoming Holiday season. Make Your Own Pizza Night is a long standing tradition at Chez Peady and I will not be the reason it stops. Not being able to eat delicious, chewy, crispy, fluffy, flavourful pizza crust (without feeling horrible) has put a serious dent in MYO Pizza night for the last little while and, quite frankly, we’ve had a lot fewer MYO Pizza Nights as a result. I have had rather hit or miss experiences with making gluten free crusts. I’ve made this cauliflower crust and had it turn out great, but I have also made this exact recipe and had it turn out terrible. There are myriads of cauliflower crust recipes now – most are still just a variation on the same theme – and I have yet to find a sure thing. So this week when I knew we were going to reinstate MYO Pizza Night, I knew I needed to approach it from a more creative place. First, I prepped the pizzas for my family using pre-baked pizza stone crusts and the toppings they enjoy most which we, pretty much, always have on hand. Everyone has favourites and MYO Pizza Night is a great time to get what you want! Daddy-O likes lots of veggies, cheese, pepperoni, and fresh jalapeño slices. Muy caliente! Thing 1 is a carnivore and if the entire pizza could be fashioned out of meats and cheeses he would be praising cheeses! Thing 2 likes a variety of flavours just as long as it isn’t too spicy. The easiest way for me to deal with this, usually, is to have everyone make their own, but in the interest of saving time (there was a movie in our FFFN* plans) I just used the pre-made crusts and whipped up two pies! One for Daddy-O (leftovers were today’s lunch!) and one for Thing 1 and Thing 2 to share (again, leftovers for lunch today!). 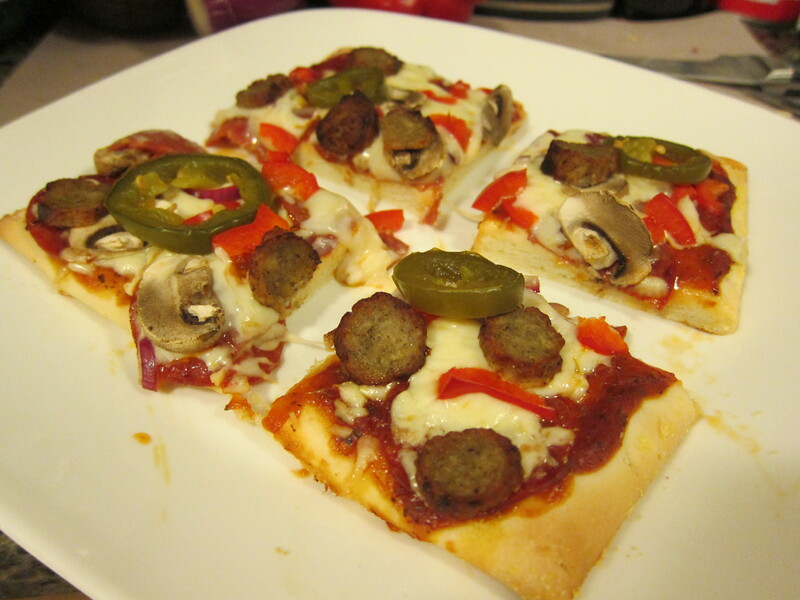 They turned out great** and everyone was happy with a very simple MYO Pizza Night to ease back in. Now what the heck was I going to do? The trouble with needing a gluten free option is that it does take a bit of planning and extra preparation. Oh look! Two things I almost never do for myself! Shocker, eh? You know what I almost always do for myself though? Think. So, I thought about what I needed and wanted and came up with a simple idea. 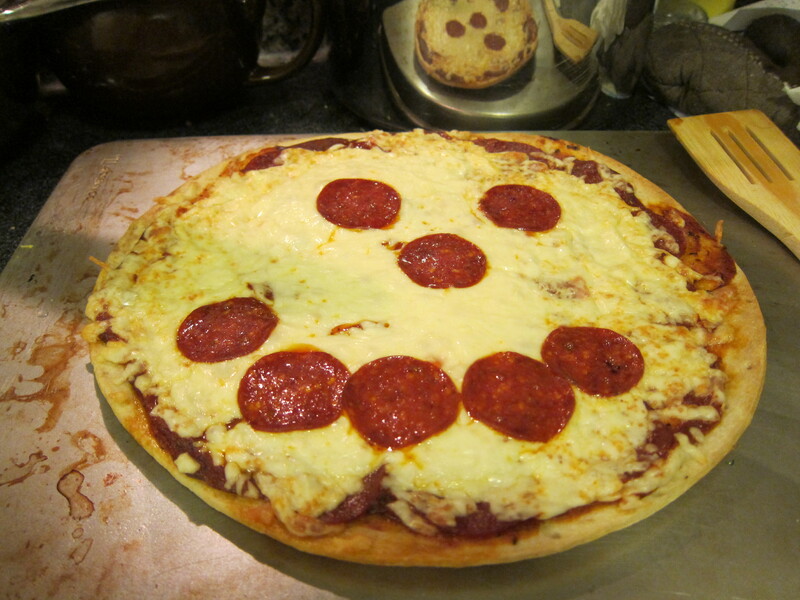 I would make a Pizza-Alike. It would have a tonne of veggies and jalapeños and it would not have a crust at all. Weird? Yup. Delicious? You bet your sweet bell peppers, it was! I used a glass pie plate and lined it with pepperoni slices (you could use another meat as a base). I added my cheese (mozzarella & cheddar). I added sliced red bell pepper, sliced mushrooms, some sliced jalapeño and a teensy sprinkle of parmesan. I popped it into a 400 degree oven until it looked all melty, golden, yummy, and the pepperoni was crisp. When it was ready, I removed it from the oven to let it cool a bit. Then I served up a few slices on a little plate with about a tablespoon of pizza sauce for dipping. 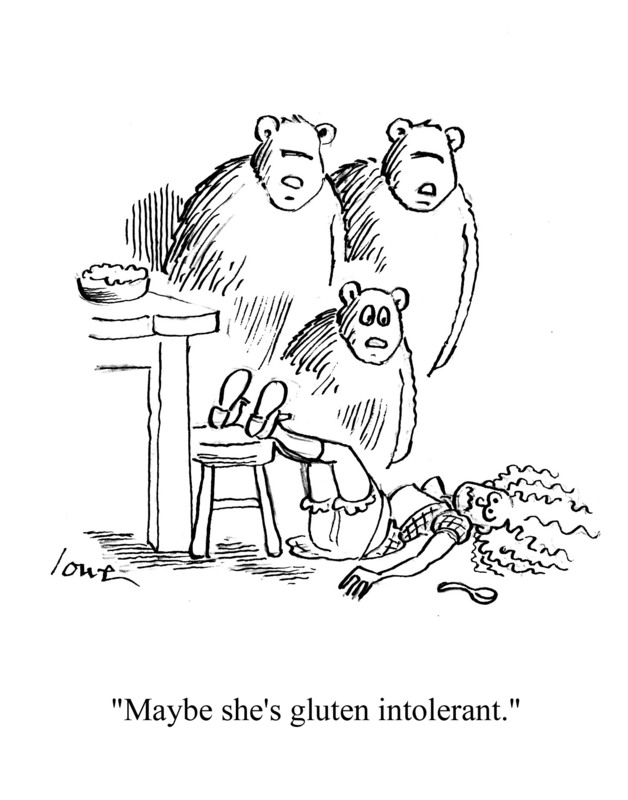 So tell me, are you gluten free? Do you eat low carb? Are there dietary restrictions *you* need to adhere to so you can be at your healthiest and happiest? 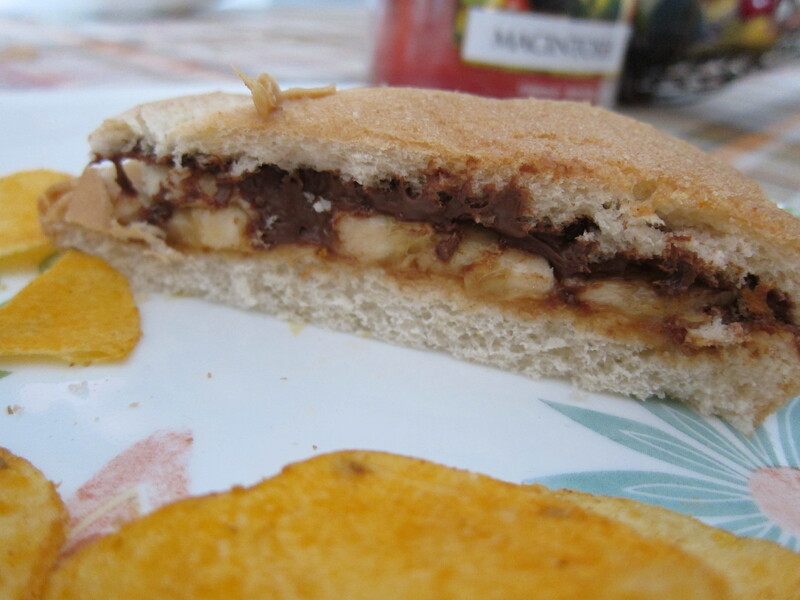 What alterations have you come up with so you can still enjoy your favourite foods? Leave a comment and share with the whole class! *Friday Family Fun Night. It’s a thing! 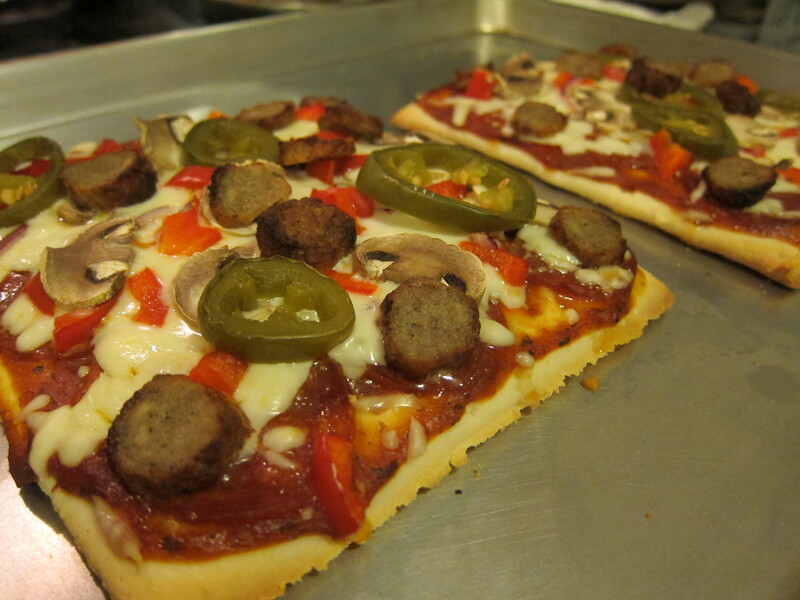 **The pizza crusts came from Costco and were an experiment. I was so happy they liked them. KISS! Simplicity rules! Well, it isn’t 5 a.m., but it also isn’t 11:58 p.m., so I’m calling that a win. Today I had the most scrumptious Big Salad for lunch. It was so good I decided to write about it, briefly, here on my blog. It was so *exactly* what I needed today. It’s amazing how a day or two of eating well can make you feel so much better than a day or two months of eating not-so-well. This NaBloPoMo is only one of three 30 day challenges I am taking. I have committed to posting here everyday. I have committed to posting a #PeadyPhotoADay on Instagram everyday. I have committed to doing something good for my health everyday. 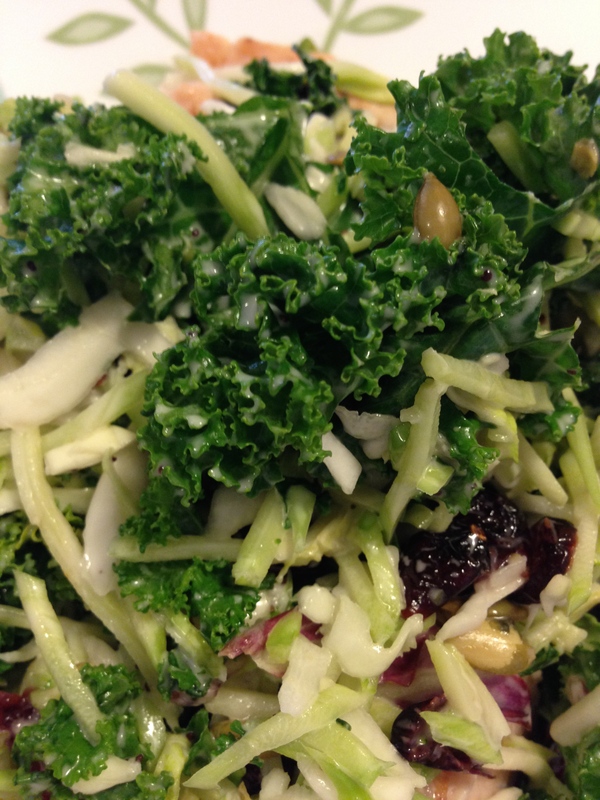 Today, this amazing salad was my “something” and it was a fantastic choice! Believe it or not that thing of beauty above came out of a package. 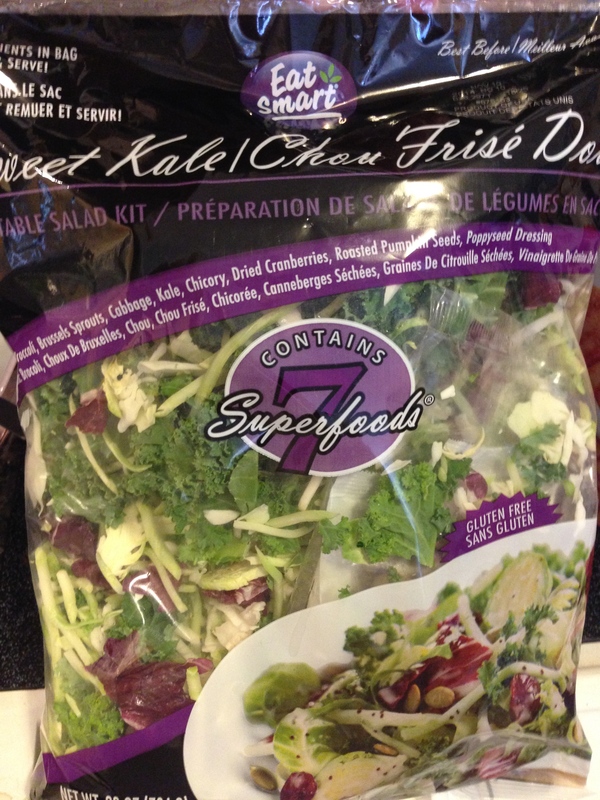 Everything you need for a delightful Big Salad right there in one place. Brilliant! I’m not a huge fan of packaged stuff, generally speaking, but today I decided that I needed a treat that would make me feel good and this aptly named salad did the trick. I bought the big bag! I added some roasted turkey for protein, to boot, and it was a perfect addition. There are cranberries in the salad and we all know how well turkey and cranberries go together, right? Yum! It would be easy to portion* out the salad to use a bit at a time, but I mixed the entire thing up and made salads for later in the week in separate containers with a protein portion in each one. A bonus classic Seinfeld** clip. So, how do you feel about Big Salads? *This would be a wonderful option for filling the “salad jars” that Pinterest goes crazy for all the time. **Also, apparently, a super-duper bonus Spanish lesson. De nada. Chrysanthemum! As Fun to Spell as it is to Say. 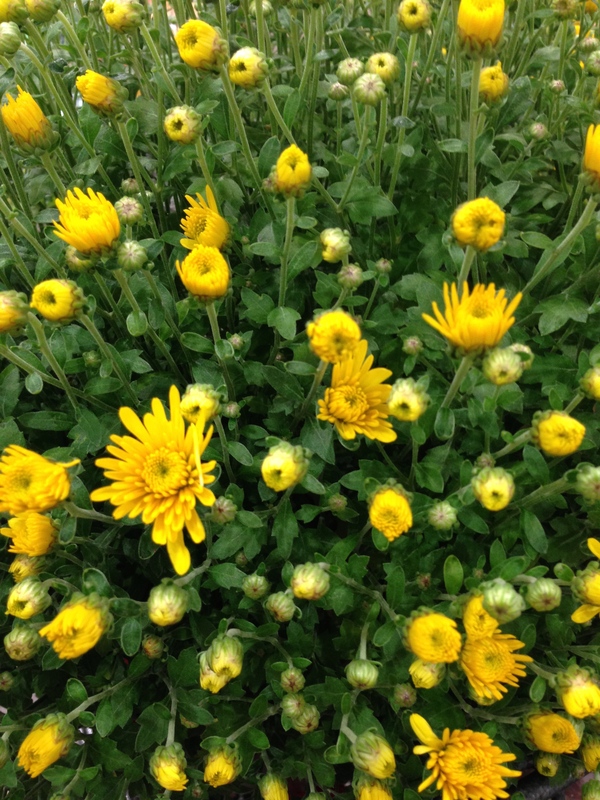 C-H-R-Y-S-A-N-T-H-E-M-U-M.
Chrysanthemums. So happy making in Fall! Despite the fact that Thing 1’s trumpet book was missing, searching high and low was netting zero results, and I had pretty much resigned to the fact it was never going to be seen again. It felt like a day for getting things done and since I had the car, had some errands to run, and some ingredients to restock, I headed to Costco. I think that Costco on a Tuesday morning is your best bet. As compared to, say, Saturday – Oh! I see! This *is* the apocalypse – Tuesday was alright. I typically put my budget blinders on as I walk through the door and focus on the needs (as opposed to the wants). Today was no different, though the list of needs was long, so it took some time to get out of there. I promise I can justify every single thing that went into my cart. My splurges were a few gluten free ingredients so I can be well prepared for this journey of mine. That is a weird word. It’s also weird that I consider basic ingredients to be splurges. Maybe it’s the sheer volume of stuff inside Costco. I’d like a bulk sized bottle of Lemon Juice. Sure I would, but I don’t want two. Where the heck would I put it? So, basics were covered (including the awesome chicken that went into our Taco Tuesday dinner! ), meal plan ingredients were procured, and I completely avoided certain parts of the store. Actually, maybe it’s less weird and more practical… possibly even wise. Then I caught sight of the Mums. Did you know I was on Mum Watch? True story. I have been looking for the giant Costco Mums since August. I am sure that when I was in Ottawa, if I waited until September I was out of luck! 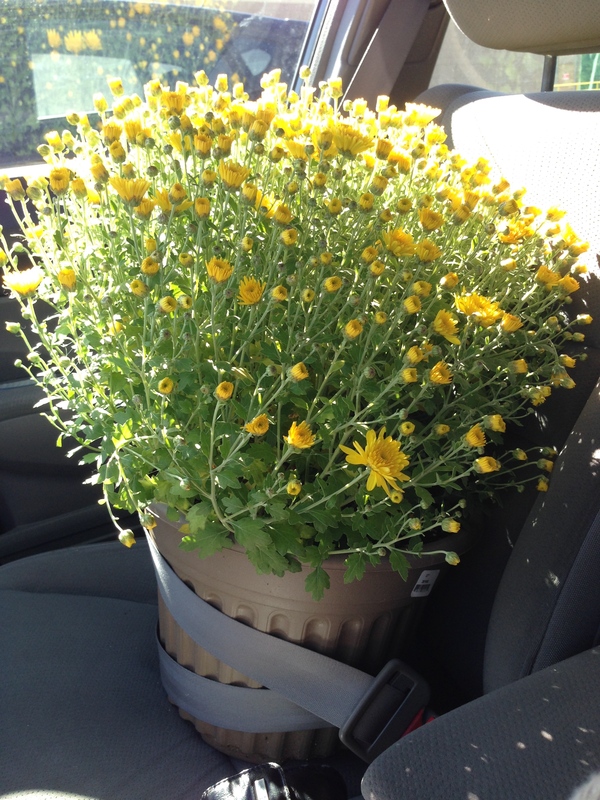 So, I am not exaggerating when I tell you I was thrilled to see so many beautiful Mums just waiting to come home with me. So, I did what any wise woman, who just so happens to be trying hard to remember to put herself on her own priority list, would do. I came home and put everything away. Revved up the CrockPot. Put the giant Mums outside. Turned the pots. Turned them again, so they would be putting their best Mum foot forward. It was a sunny day and I felt very happy I went with my gut instinct and chose YELLOW*. It was a good choice. So pretty! And then, as luck would have it, I went with my gut instinct, again, and found Thing 1’s Standard of Excellence Trumpet Book. It was wedged between his dresser and the wall of the closet (which is where the dresser lives) because of course! So, I reached down and pinched that little pink corner and whipped out “The King of Pride Rock“. No, no, *not* Mufasa, silly! The sheet music from band.. from last year… which is always tucked inside the trumpet book and ZOMG! THE TRUMPET BOOK! Okay! I am done** with Tuesday! It’s been excellent and frankly, I do not want to tempt fate by asking for a single thing more. 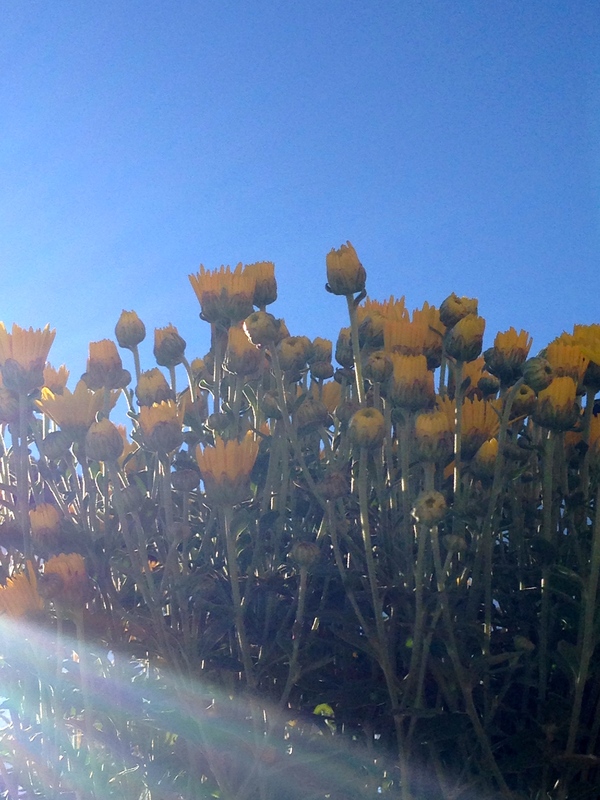 Today’s sky and sun and my new Mums. Now, what kind of payback can I come up with to make sure this never happens again? Thing 1 owes me. I can’t get my time back, but I am sure there’s a life lesson*** in this whole scenario. *Well YELL is right in there, so you have to! **Nope. I managed to get dinner going, go for a walk with my NS BFF, and just before bedtime took the jammified Things for a little drive to return library books and DVDs we had borrowed. The last time I returned DVDs, this happened. Tonight we saw a fawn. So beautiful! It’s been a lovely day. *** For all of us. Chimichanga! As fun to eat, as it is to say! In a skillet put browned ground beef (or brown it! ), leftover burrito filling use it up! ), corn (frozen), red pepper diced. Using up lots of bits from previous meals. Add chopped tomato and refried beans (leftovers in this case). Thing 1 took this “action” shot of one of my tricks. I’m snipping red pepper strips with my kitchen scissors. Easy peasy! 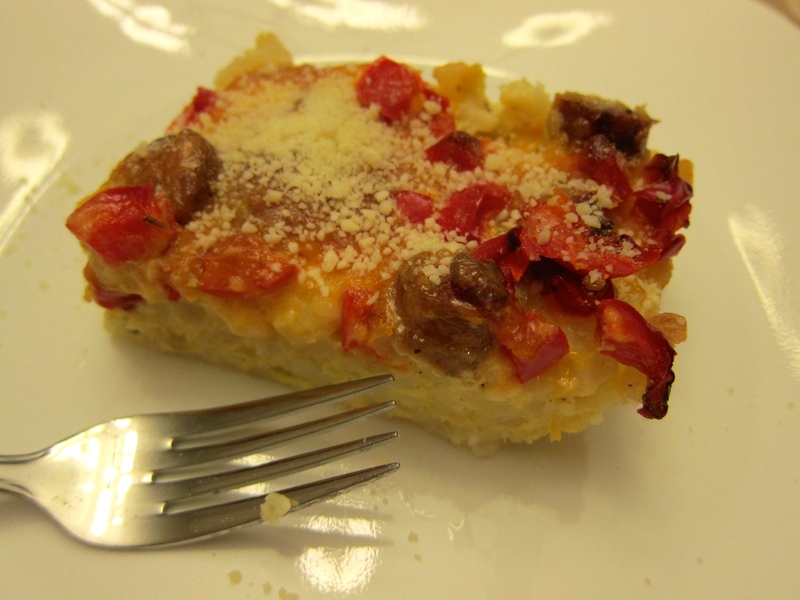 Since this is “to taste” I added a bit more red pepper and corn. Turn off heat. Let mixture sit for a few minutes. The flavours will just keep blending beautifully. This is a good time to melt your butter. Yes. Butter! (About 1/3 cup. Melted. To be brushed on the wrapped Chimichangas. Gluten free tortillas, Traditional and a single smaller leftover tortilla from Burrito night. Perfect size for Thing 2. See? Much smaller! Just right for a teeny tummy. Once they are wrapped and the seem side is down, brush with the melted butter. It looks so sinful, doesn’t it? Here is my GF tortilla. It’s pretty stiff. I brushed it a bit first in hopes to soften it, but it didn’t really work. My cracked Chimichanga. Boo hoo! You can see right inside. I kind of expected to see a big mess. I baked them at 350 for about 15 minutes, before adding cheese. Then I forgot to take a photo of the cheese, so I pretty much stuck my face, hands and camera into a 350 degree oven to get a shot. The lengths I will go to for you sweet readers! Ai yi yi! Melted cheese on a crispy Chimichanga. I like the lacy cheese crisps. Comparrison: GF vs. Gluten full. I want this one soooo bad! Here is Thing 1’s plate. Here is Thing 1 digging in. *Bonus! How to fill and fold a Chimichanga for leak-free baking! **Bonus bonus! “Homemade” Guacamole with Rick Bayless “Frontera” enhancement. Perfectly ripened avocados & Frontera Guacamole mix. It seems to want to get to know the avocados better. Ingredient list is short. That’s great! I love a perfect avocado. It always feels like a little win. Mmmm! You are so perfect. I’m gonna mush you now! Three avocados (because I’m a rebel) and the mix. ***Thing Bonus! The reasons I do the things I do. Someone had an epic playdate earlier and needed a pre-fiesta siesta. D’awww. BB is such a good body guard. Never shuts her eyes! Happy Things make me happy. 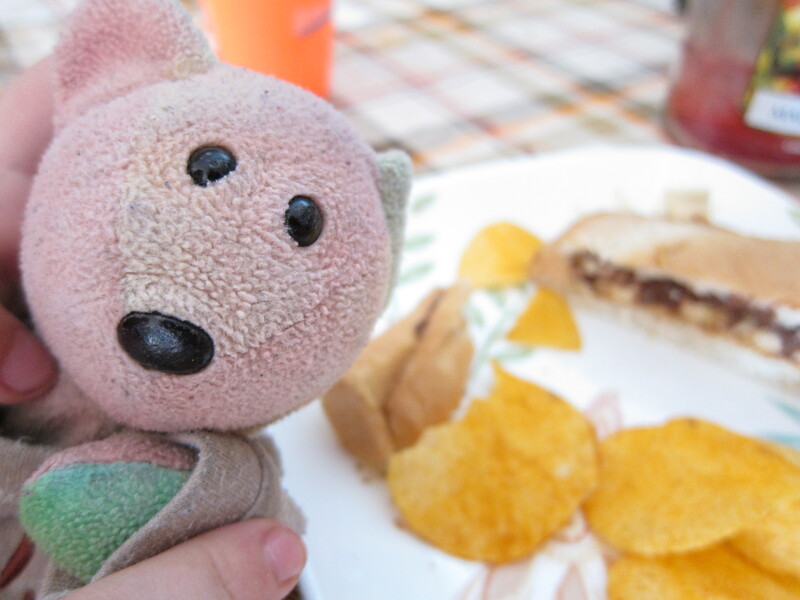 Thing 1 loved the naturally occurring cheese “crisps”. Yum! And that’s how we do “Tex-Mex Week” at Chez Peady! I hope you enjoyed seeing our “Tex-Mex Week” as much as we enjoyed documenting it. Do you ever pick a theme and explore it with your kiddos? What kinds of things does your family do to learn about different cultures, countries or cuisines? If you decide to have a Tex-Mex week – or another theme week, I’d love to hear all about it!